Arrivederci Chicago. Buon giorno Roma! As you can see, we celebrated this Independence Day from 31,000 feet. 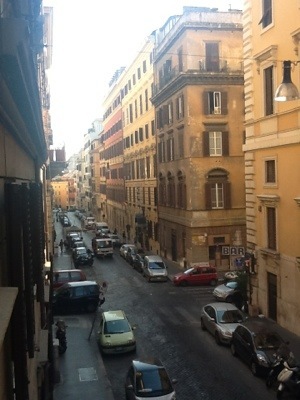 We arrived in Rome at 9:00am Italy time on Thursday. This trip has been planned so long, it’s hard to believe we’re here. The motivation for the trip is Nick’s parents’ 40th wedding anniversary (as if you need motivation to travel to Italy). They’re providing the Tuscan Villa and our job is to show up and enjoy ourselves. I think we can handle that. Before we settle into relaxation mode, we’ve booked three nights in Rome to kick off the trip. We’re staying at the Hotel Caravaggio in the center of the city. We’ve booked a tour of the underground portion of the Coliseum and a nighttime entrance to the Vatican museum (featuring a 28 guitar orchestra concert!) Other than that, we’re keeping our options open and are soaking up as much Rome as we can. One interesting fact, is that this will be the first time we’ve traveled somewhere where neither of us speaks the language. – When was the last time you were on a plane where you couldn’t control the air vent? – Why is The Rock allowed to keep making movies? – Will they let us have another bottle of wine? – Was that a bad dream or did someone really make a movie about boxing robots? – Is he an off-duty flight attendant? This entry was posted in En Route. Bookmark the permalink.